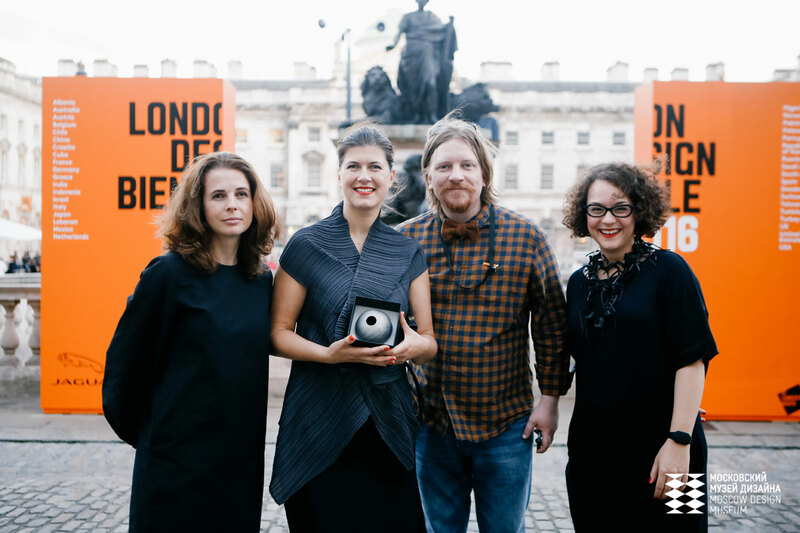 Team Russia (L-R): PR and development director Olga Druzhinina, Museum's director Alexandra Sankova, art director Stepan Lukyanov, international relations specialist Natalia Goldstein. The Russian exhibition at the very first London Design Biennale has won acclaim for its response to the theme of “utopia,” earning a medal for its creative approach. RBTH spoke to the director of the biennale, Dr. Christopher Turner, as well as a representative of the Moscow Design Museum, which organized the exhibition. The very first London Design Biennale is currently welcoming visitors at London’s Somerset House, which has been almost completely taken over for the event, which runs until Sept. 27. With 37 countries from six continents participating in the event, a spread of countries from all over the globe is represented. Russia was represented by the Moscow Design Museum with the exhibition “Discovering Utopia: Lost archives of Soviet Design” and was awarded a special medal for the best response to the biennale’s main theme – utopia in design. “We chose the theme ‘Utopia’ by design, because it’s 500 years since Thomas More published Utopia, his work on political philosophy that has been so influential for architects and designers for a long time,” the biennale’s director Dr. Christopher Turner told RBTH. Among the countries participating, Turner highlighted Chile, Lebanon and Russia. “I really like the historical displays where people are encouraged to look backwards as well as forwards, back at their own history, at failed utopian schemes in their particular countries” he said. The Russian exhibition, put on by the Moscow Design Museum, displays for the first time the lost archives of Soviet design, the futuristic projects developed by the All-Union Research Institute of Technical Aesthetics (VNIITE). Most of these schemes never got off the drawing board, like the concept of a future domestic electronic system called Sphinx or the first program for sorting refuse and recycling, called Vtorma. The exhibition shows photos and video interviews with staff members of VNIITE. “Everyone was completely captivated by all those pictures… and I like the way they displayed it like some archive that has just been discovered – these huge slides in the light boxes on the wall and also the interviews with the designers that they managed to put together,” Dr. Turner told RBTH. On Sept. 17 the biennale will host a large program called Russian Design Day, with lectures by prominent designers on Soviet projects from 1960-80 (the word “design” was forbidden till 1989). The day will end with a documentary screening on the history of Russian design. Alexandra Sankova thinks that with some modifications and additions, all of the abandoned projects on show by Soviet designers could be put to use. The Moscow Design Museum was not alone in its willingness to revive the memory of Soviet utopian design: Russian state corporation Rostec and the Ministry of Industry and Trade acted as exhibition partners. “After the collapse of the Soviet Union industrial design was no longer paid sufficient attention in our country, which has led to the lack of it as a phenomenon today,” said Rostec communications, analytics and strategic research director Vasily Brovko. In 2015 Rostec took steps to revive industrial design in Russia by restoring the VNIITE institute of technical aesthetics and holding an open competition for industrial designers in Russia. Gleb Nikitin, first deputy minister of industry and trade, also noted the importance of design in all kind of industries: “The designer should become the complete participant of the production process starting with project development and finishing with the final manufacturing of the product,” he said. He also congratulated Russian designers for getting a medal in such a prestigious event. London is currently awash with reinterpretations of the Soviet legacy in art. Until Oct. 15,the GRAD gallery is hosting the exhibition “Superwoman: Work, Build and Don’t Whine,” exploring the image of Soviet women in propaganda from the Russian Revolution of 1917 to perestroika. Menawhile, the Calvert 22 Foundation is offering a whole season of exhibitions, educational events and film screenings devoted to the Soviet Union, called “Power and Architecture,” on show until Oct. 9. It is dedicated to utopian buildings in post-Soviet spaces that were originally intended to display the power of the Soviet authorities. This season in Calvert follows another, “Red Africa,” that explored Soviet-African relations. He added that he considers it very important that contemporary Russian designers look back at their history, and also expressed a regret that the Moscow Design Museum does not have its own building. Russia Beyond The Headlines is official media partner of the Moscow Design Museum exhibition.